Some people might not know this, but I do all of my own glaze formulation. Every color I have, and every glaze I use is the result of countless hours mixing, testing, altering, and retesting any of a number of components. Although I am well versed in the theoretical approach to glaze development, and see that as a valuable chunk of knowledge, I practice the pragmatic, result-driven approach to glaze development. I dumb everything down and just mix endless tests and see what works rather than think about what should work and be disappointed when it doesn’t. This approach is the best fit for me, and has served me well. Over the years, I have refined my process to be quick, efficient, and accurate. 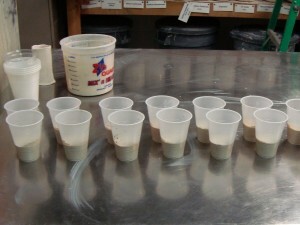 Using a method taken from Ian Currie’s “Revealing Glazes”, I carefully mix the base glaze and then measure it into a series of cups, each of which will get a different colorant. This will give me a decent starting point to refine my search. 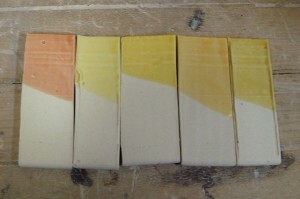 Some colorants will work and some will not, based on the chemistry of the glaze, the temperature it will be fired to, and the atmosphere in which it will be fired. The first step in trying to get a certain glaze color is to find the colorants that will work in that glaze base. You could look up in a chart what each stain’s requirements are and then match them to your glaze, or you could spend an hour doing some tests. I prefer the latter. I start by finding all of the stains available to me in the desired color range. At the U of L studio, we have an exhaustive and well-organized stockpile of mason stains. Although I generally steer clear of stains, In a matte glaze, the granularity of them will not be as much of an issue, and for colors like yellow and pink, it is much easier and more reliable to use stains. For an initial test, I decided to add 5% stain to each test cup, knowing that it would most likely yield a pastel saturation of color, which is what I want. In the interest of minimizing the amount of material used, I will put 50g of dry glaze into each cup, and weigh 2.5g of each stain. I will be measuring out 20 cups of 50g each. Here is “the easy way” to do it. 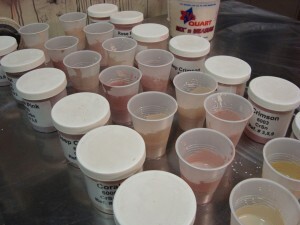 I start with a 1000g batch of the dry base glaze, dry mixed, in a Mix ‘n Measure bucket, available at any hardware store. 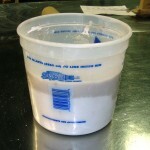 It is important that it is a graduated bucket, having lines indicating metric volumes. 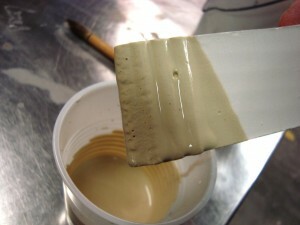 The glaze is thoroughly mixed using a stick blender. 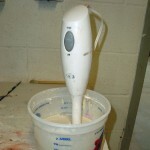 Care must be taken not to spill any of the glaze and it must be shaken off of the stick blender to ensure accuracy later on. I add water until it is to the desired consistency. I then add more water to bring the entire volume up to one of the measured lines on the bucket. 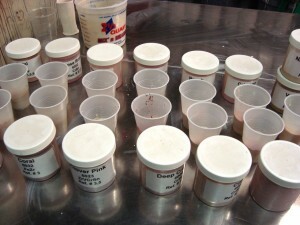 It will either be 1 liter, 1.25 liter, or 1.5 liters, depending upon what materials are used in the glaze. Now it is time to figure out how to convert this volume into its equivalent dry weight. 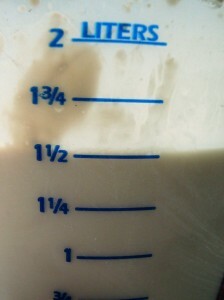 Divide the volume, 1500 liters, by the dry weight, 1000g. 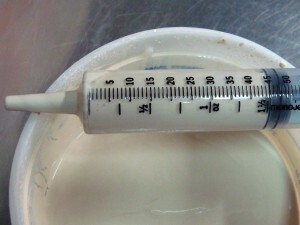 1500/1000=1.5 ml/g dry This means that if I want to weigh out 100g cups, all I have to do is squirt 150ml (or cc) into a cup using my catheter tip 60cc syringe. As stated before, this time it makes sense to use 50g cups, so I will squirt 75ml into each cup. 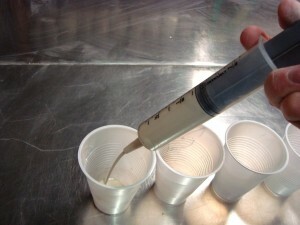 My syringe only measures up to 60ml, so each cup gets one shot of 35, and one shot of 40. Now that I have all of my cups measured and lined up, I bring out the stains. I used to label each cup with a code, and then use the code to label each tile. This is another thing that I have dumbed down for the sake of efficiency. 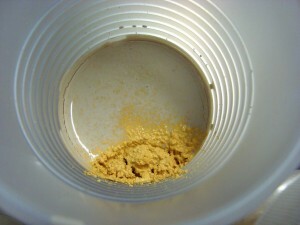 I simply place the stain right next to the cup as I weigh the colorant into it. Since all cups are getting 5%, there is no need to keep records, I can remember that much. The water that collects at the top of the cup while the glaze material begins to settle really comes in handy at this point. 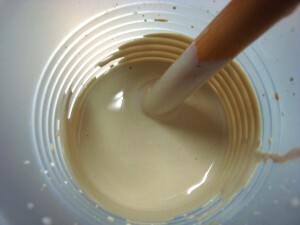 I usually let these cups sit around slaking the dry stain while I go do something else. Once I am ready to dip tiles, I get a bucket of water for rinsing, a small brush and some iron wash for labeling, a large glaze brush for stirring, and all the tiles and tile holders I will need. I stir one cup at a time, and then immediately dip a tile and label it. I place the cup back where it was. 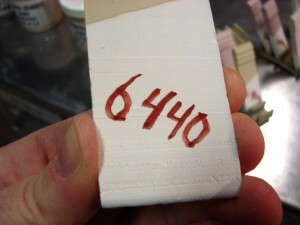 I label the tile with the number of the stain, a 4 digit number starting with a 6. This way I will easily know which stains worked without having to refer to my records. I really don’t keep very good records, so why try? Then into the kiln they go. 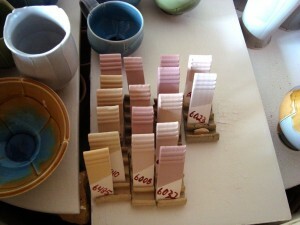 I try to get at least one little experiment into every kiln I fire. I like having a development of glaze alongside the ongoing development of form that happens as I work. This whole project took only an hour, start to finish. From my efforts, I found a lot of pink stains that will not work, which is good info to have, and I found a few promising yellows, from lemon to marigold. I will test these further. Thanks for reading this, and please feel free to leave questions and comments. Since my stick blender is stored in my kitchen is there any reason that I shouldn’t be doing my glaze testing on my counter top next to the sink? Am thinking the dishwasher may come in mighty handy…..and I can snack as I work. Great blog Jeff. I’m going to turn my students on to it. I see no reason not to use your kitchen one. You can use that batch of Butternut Squash Soup to rinse it. Save on electricity while multi-tasking! note: if you order 20 syringes from a sheep supply company, be prepared for an overwhelming amount of shocking, sheep insemination equipment catalogs filling your mailbox, and possibly creeping out the other tenants in your building. Cool idea, I just ordered some syringes and I am bracing myself for the sheep mail! What do you make the tile holders out of and how do you make them?